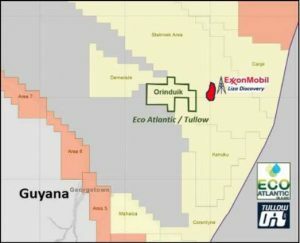 OFFSHORE OIL AND GAS MAGAZINE,-TORONTO – Tullow Oil and Eco (Atlantic) Oil & Gas have identified various leads on their Orinduik block offshore Guyana that could contain more than 1 Bboe. The leads are drawn from studies of several thousand kilometers of 2D data, regional well logs and seismic correlations to ExxonMobil’s nearby Stabroek block wells. Some of the leads appear to be equivalent in age to the Liza reservoir. Last year WesternGeco completed a 2,550-sq km (984-sq mi) 3D seismic survey over Orinduik, and PGS is currently processing the results in the UK. Eco has contracted Gustavson Associates in Colorado to provide independent interpretation services. Gustavson will also provide a competent persons report under AIM Guidelines and an NI-51-101 report under TSX Guidelines: the consultant has previous experience in the Guyana basin. In addition, Eco has received the initial, conditioned PreSTM and fasttrack 3D data sets and has forwarded these to Total which is considering farming into Orinduik, for its own interpretation.